The actors breathe the same air as the audience. That is the magic of live theatre. Sometimes the actors flub, but usually recover beautifully. If you are close enough, you can see facial expressions, make-up, and costume details. You are right there with the performers. The performance began with a procession of nuns coming down each aisle carrying candles and chanting in Latin. Having grown up Catholic, I was immediately enthralled. It got better from there. The stage was deftly transfigured from a nunnery, to a mountain backdrop, to the elegant Von Trapp family home. Set technicians (for whom I have great respect) quenched the lights and in a minute, voilà! It is easy to create magic with technology and buckets of money. Not so easy with paint, plywood, and a shoestring budget. But the “Holly Theatre” achieved that goal. I loved the movie but the story never affected me as it did on stage. Von Trapp and Maria were wonderful, as were the Baroness and Max. But the children stole the show. They were so beautiful, talented, and obviously enjoying themselves. I wanted to hug each one of them. The biggest surprise was a young woman who played Mother Superior. When she belted out “Climb Every Mountain”, I don’t think there was a dry eye in the theatre. A patron beside me pointed out the woman’s parents a few rows ahead, and I could only imagine how proud they must be. Theatre—especially a little theatre—creates intimacy. I enjoy movies, but it is not the same, especially the Hollywood epics where everything is perfect—unless it is purposely grotesque. I lost myself in this musical. When the Von Trapp family was singing at the festival, I had chills looking at the Nazi flags unfurled on either side of the stage, blood red and emblazoned with swastikas. Soldiers were positioned above the stage with guns trained over the audience. This really happened in my parents’ lifetime. For a moment, I was transported back and could imagine what it must have felt like for the victims. When the Nazis realized the family had escaped, storm troopers poured down the aisles scanning the audience with flashlights. That doesn’t happen in a movie—even with 3D. 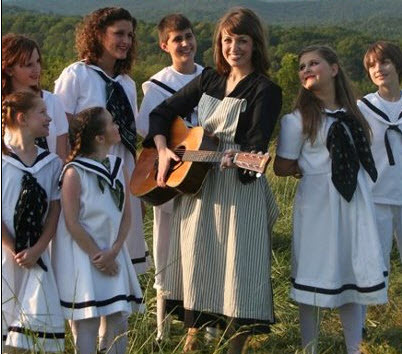 The production ended with the Von Trapp family tromping up the aisle on their way to the Alps. I am a sucker for a story where good triumphs over evil. It revives my soul. Judging from the standing ovation, the audience agreed. When we exited the theatre, the entire cast welcomed us on the sidewalk outside. What a treat! If you have a local theatre near you, don’t hesitate. GO! They cannot survive without your support, and I suspect we need them as much as they need us.